Suave denim jacket with batik patchwork and zipped pockets. 100% Cotton. Cotton Lined. Hand Wash Separately. Do Not Bleach. Regular Size. Due To Nature Of Fabric, Colour May Run During First Few Washes. Batik stamp print jumpsuit with cut sleeves and keyhole detail. 100% Cotton. Cotton Lined. Back Zip. Hand Wash Separately. Do Not Bleach. Iron On Reverse. Regular Size. Due To Nature Of Fabric, Colour May Run During First Few Washes. EVERY PIECE IS UNIQUE. LIVE CHAT TO SELECT BEFORE PURCHASING. Batik fitted mini skirt with crochet lace and dip hem. 100% Cotton. Concealed Back Zip. Fully Cotton Lined. Hand Wash Separately. Do Not Bleach. Iron On Reverse. Due To Nature Of Fabric, Colour May Run For First Few Washes. Regular Size. BATIK IS UNIQUE. LIVE CHAT TO SELECT BEFORE PURCHASING. 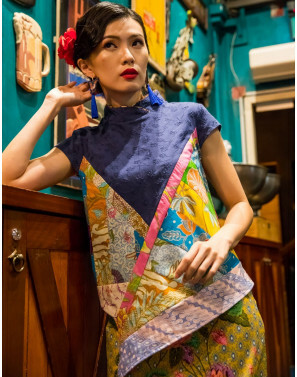 Oriental style batik blouse with denim embroidery details and pocket. 100% Cotton. Exposed Back Zip. Hand Wash Cold. Do Not Bleach. Iron On Reverse. Due To Nature Of Fabric, Colour May Run For First Few Washes. Regular Size. BATIK PRINT/COLOUR IS UNIQUE. LIVE CHAT TO SELECT BEFORE PURCHASING. Inspired full embroidered kebaya with a modern twist. 100% Polyester. Full Embroidery. Hand Wash Separately. Do Not Bleach. Warm Iron. True To Size. Denim eyelet embroidery on gold batik with peek-a-boo keyhole. 100% Cotton. Denim Back Zip. Front Pockets. Hand Wash Separately. Do Not Bleach. Iron On Reverse. Regular Size. Due To Nature Of Fabric, Colour May Run During First Few Washes. EVERY PIECE IS UNIQUE. LIVE CHAT TO SELECT BEFORE PURCHASING. Oriental tunic dress on pastel batik stamp. A-line with side pockets. 100% Cotton. Cotton Lined. Back Zip. Hand Wash Separately. Do Not Bleach. Iron On Reverse. Regular Size. Due To Nature Of Fabric, Colour May Run During First Few Washes. EVERY PIECE IS UNIQUE. LIVE CHAT TO SELECT BEFORE PURCHASING.